Alfred A. Knopf and Little, Brown & Co. The President Is Missing is a political thriller novel by former US President Bill Clinton and novelist James Patterson published in June 2018. It is Clinton's first novel. A television adaptation is being developed by Showtime. The book begins with US President Jonathan Lincoln Duncan rehearsing a potential testimony with a House of Representatives select committee. It has been discovered that the president made a phone call to Suliman Cindoruk, the leader of the cyberterrorist group Sons of Jihad, and he is accused of negotiating with a terrorist. It was also discovered that the president ordered an attack to stop some Ukrainian operatives in Algeria who were attempting to kill Suliman. In the attack, an American CIA operative was killed and Suliman escaped. The president's aides advise him against testifying at the hearing, believing it will only lead to impeachment proceedings. Duncan has had immune thrombocytopenia—a disease causing low platelet count—for most of his political career, and the disorder has recently flared up again recently, forcing him to take steroids that impair his mental ability. Duncan then meets with the Speaker of the House, who has been the primary advocate for impeachment, and unsuccessfully attempts to convey to him the strategic importance of his suspicious-looking decisions. Duncan's daughter, who is studying in Paris, receives a message with the code "Dark Ages" from a young Eastern European woman named Nina. She tells her father about the strange person and the message, and she is requested to come back home immediately. The code word was known only to eight people, all high-ranking Cabinet or Cabinet-level officials, and is the code name for a cybersecurity operation that America is running after its systems were hacked. Determined to know the source of the leak, the president invites Nina to the White House. She tells the president that she only has half of the information the president needs. In order to get the full story, he must meet with her partner, who will give him the remaining pieces of the puzzle. Nina asks Duncan to meet her partner in a stadium where a baseball game is scheduled to take place later that week on a Friday. The president arrives at Nationals Park, incognito and without Secret Service protection, and meets the partner, named Augie. Meanwhile, mercenaries who were contracted by Suliman Cindoru—a sniper known as Bach and two ground units—prepare to ambush and assassinate Nina and Augie. As Augie and the president leave the stadium, the assassin shoots and kills Nina, who was waiting in a van for the president and Augie, and the ground units converge. Duncan, who fought in the Gulf War with the Army Rangers, takes Augie's gun and manages to shoot two members of the ground team. The arrival of the Secret Service stops the shootout, and the president and Augie are extracted. The Secret Service, ignoring the president's demands, had followed him after seeing the baseball tickets while searching Nina earlier at the White House. The president's convoy heads to Virginia, but they are ambushed again. Two Secret Service agents are killed in the ensuing attack, but the president is unharmed and drives off with Augie. He arrives at a safe house, where he takes stock of the events of the evening. He learns that Nina and Augie created and distributed a highly destructive computer virus for Suliman, but they left and warned the US when they realized what it would do. The virus is scheduled to take effect the next day, which begins in a few hours. In the morning, a Laboratory Response Network building in Los Angeles is destroyed in an explosion, and soon after, investigators discover that a large California water treatment plant was hacked and was about to distribute contaminated water. Believing it to be a decoy, the president keeps his top cybersecurity team working on the virus threat instead of diverting them to help in California. He had previously arranged a covert meeting with leaders from three other major countries. The Prime Minister of Israel and the Chancellor of Germany arrive and are greeted warmly, and Augie explains the full extent of Dark Ages: it is an attack that would completely destroy the data on every internet-connected device in the US, leaving the country vulnerable to outside attack and forcing the government to retreat from its foreign policy objectives. The President of Russia was invited but sent the Prime Minister in his place; this creates distrust among the other delegations, who see it as another sign that Russia is sponsoring the attack. Duncan reveals that the US military has quickly built a rudimentary international network to maintain defensive abilities in the event of the Dark Ages virus launching. Duncan begins to suspect his vice president of being the leaker. She is still bitter that Duncan had beat her in the primaries, and she would take over as president if Duncan were impeached. The cybersecurity team, with Duncan's help, discover a way of rendering the virus ineffective, so they test it on a server at the Pentagon. This test inadvertently sets off the virus throughout the nation, but it is suspended after deleting only a few files. If the correct disable keyword is not entered in thirty minutes, Dark Ages will wipe everything out. At the same time, Bach and Suliman's other mercenaries attack again to kill Augie, but they are stopped by the Secret Service and a Marine Corps helicopter, and Bach is captured. Duncan assembles his top aides to try to guess the password, and at the last second his chief of staff correctly guesses the password and disables the virus. As they return to the White House, Duncan reveals that he had actually earlier entered the password, which he got from text messages with the anonymous leaker recovered from Nina's phone. Assembling his team to guess was just a ruse to lure the leaker into the light. The president confronts his chief of staff and tells her that he has evidence that she leaked "Dark Ages", and she tipped off Suliman as well. She had to tried to frame the vice president, so she could be the hero and then take over as vice president, rescuing a once-promising political career nearly ended by a microphone gaffe. Duncan learns that Suliman had been sponsored by Russia and a faction in the House of Saud, both of whom wanted to weaken the superpower status of the US so they could expand their territory without interference. The president's popularity soars, and impeachment talks are dropped. Clinton and Patterson went on a 16-meeting tour to select the right outlet for a theatrical film. However, Showtime is turning the book into an ongoing drama series. Showtime president and CEO David Nevins said that "the pairing of President Clinton with fiction’s most gripping storyteller promises a kinetic experience, one that the book world has salivated over for months and that now will dovetail perfectly into a politically relevant, character-based action series for our network." In his review of the novel for The New Yorker, Anthony Lane argues that The President Is Missing "maximizes its potency and fulfills its mission" while commenting negatively on the book's prose, the absurdity of its plot, and the use of product placement. James O'Sullivan published an analysis in The Guardian which uses stylometry to show that the novel was primarily written by Patterson. In a negative review, Will Gompertz of the BBC gave the novel 1 out of 5 stars, calling it "predictable, dull and uninteresting". The book topped The New York Times Best Seller list by the June 24 edition. Alfred A. Knopf announced that the book sold 250,000 copies in all formats during its first week. Nielsen Bookscan, which represents around 85 percent of print book sales, reported that at least 152,000 of the copies sold in its first week were hardcover. The book's first week sales were the highest in the adult fiction genre since the 2015 release of Go Set a Watchman and the highest in fiction since the November 2017 release of Diary of a Wimpy Kid: The Getaway. The book again topped the Best Seller list for the July 1 edition. The book would again top the Best Seller for the July 8 edition as well. The book would also top the Best Seller list for the July 15 edition. By July 6, 2018, Publishers Weekly stated that the book sold nearly 384,000 copies by the end of June and was the top selling new novel for the entire first half of 2018. The book would also top the Best Seller list for the July 22 edition. It then topped the Best Seller list for the July 29 edition. On August 8, Knopf announced that the book sold one million copies in North America alone. ^ a b Rafferty, Andrew (8 May 2017). "'The President Is Missing:' Bill Clinton, James Patterson Pen New Novel". NBC News. NBC. Retrieved 22 September 2017. ^ Berenson, Tessa (June 4, 2018). "Bill Clinton and James Patterson's New Novel Is Worth a Read—But Not Just for the Plot". Time. Retrieved July 4, 2018. ^ Andreeva, Nellie (22 September 2017). 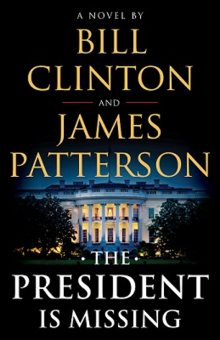 "Bill Clinton & James Patterson's Novel 'The President Is Missing' Lands at Showtime for TV Series Adaptation". Deadline Hollywood. Retrieved 22 September 2017. ^ "Former president Clinton working on novel with famed suspense writer". Reuters. 8 May 2017. Retrieved 22 September 2017. ^ Hibberd, James (22 September 2017). "Bill Clinton's first novel to become a Showtime TV series in major deal". Entertainment Weekly. Time Inc. Retrieved 22 September 2017. ^ Lane, Anthony (June 18, 2018). "Bill Clinton and James Patterson's Concussive Collaboration". The New Yorker. Retrieved 2018-06-07. ^ O'Sullivan, James (2018-06-07). "Bill Clinton and James Patterson are co-authors – but who did the writing?". The Guardian. London. Retrieved 2018-06-07. ^ Gompertz, Will (2018-06-09). "Will Gompertz reviews Bill Clinton's The President is Missing". Retrieved 2018-06-09. ^ "The New York Times Best Sellers". The New York Times. June 24, 2018. Retrieved July 4, 2018. ^ a b c d Lewis, Andy (June 13, 2018). "Bill Clinton, James Patterson Novel Sells 250,000 Copies in First Week". The Hollywood Reporter. Retrieved July 4, 2018. ^ "The New York Times Best Sellers". July 1, 2018. Retrieved July 4, 2018. ^ "The New York Times Best Sellers". July 8, 2018. Retrieved July 4, 2018. ^ "The New York Times Best Sellers". July 15, 2018. Retrieved July 5, 2018. ^ "Print Unit Sales Rose 2% in First Half of 2018". PublishersWeekly.com. ^ "The New York Times Best Sellers". July 22, 2018. Retrieved July 12, 2018. ^ "The New York Times Best Sellers". July 29, 2018. Retrieved July 19, 2018. ^ "Bill Clinton's debut novel is a million seller". ^ "Bill Clinton's debut novel, 'The President is Missing' is a million seller". 9 August 2018. ^ "Bill Clinton's debut novel is a million seller - TribLIVE". triblive.com.